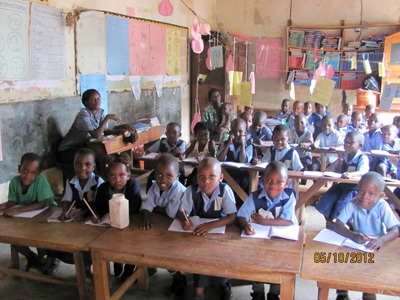 Children in Uganda attend primary school for seven years from the age of five six but many attend a nursery class for three years before this. They start learning English at nursery and by the time they are in Year 2 or 3 they begin to be taught all subjects in English all the time. The syllabus in all schools follows the Ugandan National curriculum. The charity arranges sponsorship for children to go to some of the fee paying primary schools in Mityana, where they teach in classes of about 30. In the academic year of 2020 the cost of sponsoring a primary child is £180 a year or £15 a month. This money provides the child with a year's school fees, a pair of shoes, shoe polish, a school uniform, pens, pencils, paper, exercise books, maths equipment, a school bag, a broom, soap and toilet paper. The schools insist on the children bringing all these things to school. The school fees pay for a lunch for the child and for a mug of dilute maize porridge at break time in the morning, often the first food or drink they have had since the previous evening. Also the children are provided with fee medical treatment. At the end of Primary Seven children take a national Primary Leaving Certificate. You have to pass this to be able to go onto secondary school and to get most jobs. Mityana is almost on the equator and so has equal hours of day and night. This means that there is not much time outside of school hours for children to study for exams as the one paraffin lamp in most homes is not enough to read by in a crowded room. Also most of the daylight hours outside school time are taken up with fetching water and helping grow food in the family garden. Consequently nearly all the primary schools try to insist that children board for their last year so as to be able to attend revision lessons before and after school. This costs an extra £185 for 2020, so the total for P7 year with fees and boarding is £365 a year or £31 a month. When children transfer from primary school to secondary school we ask for a one-off donation of £70 to buy the essentials for equipping them for secondary school e.g. PE kit, lab coats etc. The cost of sponsoring a secondary student in 2020 is £300 or £25 a month. 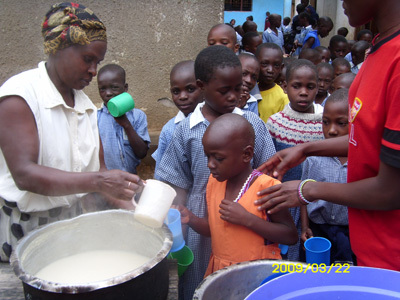 Children lining up for a breaktime mug of posho. It's probably easiest for many people to pay by Standing Order monthly or yearly (starting in November). For those who wish to pay by cheque , please make cheques out to Mityana Charity and post them to The Treasurer, Mityana Charity, 57 Trevelyan, Bracknell, Berkshire, RG12 8YD. If you pay tax we ask that you also fill in a Gift Aid form and post it to the Treasurer. This will provide us with the funding to help pay for our overhead costs in Mityana.